Central Industrial Security Force (CISF) is going to conduct written test for the posts of Head Constable (HC) Ministerial. The written exam is scheduled to be held on 29 May and 05, 12 June 2016. Earlier Central Industrial Security Force had completed the process of getting applications for 700 posts. Those candidates who had applied, can download CISF HC (Min) Exam Admit card from the direct link given below. CISF is going to conduct written exam in upcoming dates for Head Constable posts. For that, admit card are going to be released soon. CISF had released the zone-wise list of candidates called for written examination. The test will be held on 29 May and 05 & 12 June 2016. The list of candidates is available now. Candidates can check their name, roll number, father's name, date of birth, exam date, reporting time and written exam centre from the lists provided above. Candidates have to download CISF Head Constable admit card from the official website cisf.gov.in via the direct link given below. The test will be held at various centres. All the important details like exam venue, roll number, date and time etc. had been mentioned in them. Earlier Central Industrial Security Force had invited applications for Head Constable (Min) posts. The questions will be of Matriculation level. Candidates have to obtain the following marks to qualify the written exam. the medical examination strictly according to merit and availability of vacancies. 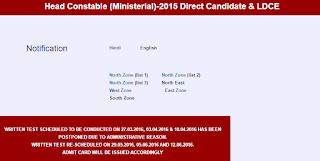 The candidates can download their admit card of CISF if released. In order to download the admit card for CISF HC (Min) exam, candidates need to visit the direct link provided here (after release). It will take you directly to download page. Then candidates need to enter their registration details and click submit. 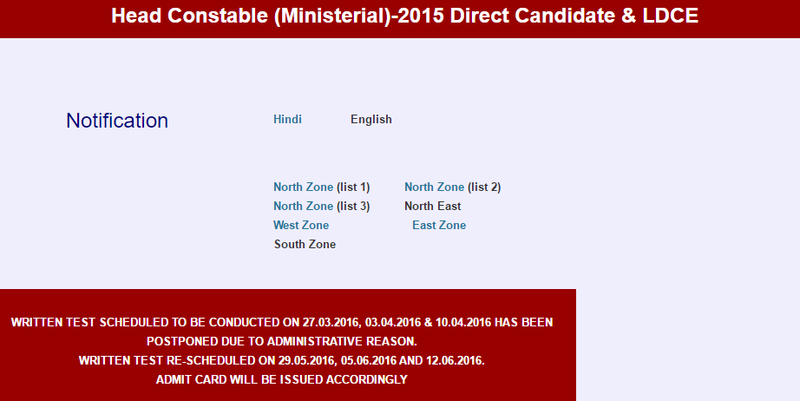 Their CISF HC (Min) Admit card 2016 will be displayed having all the details.